There’s no doubt that 3D printing is taking many industries by storm – so imagine what it would do when 4D comes into play. And that’s exactly what the ARC Centre of Excellence for Electromaterials Science (ACES) at the University of Wollongong (UOW) are working on. It claims that 4D printing is unfolding as technology that takes 3D printing to an entirely new level. It said, in a report, that the fourth dimension of this evolving style of printing is shape shifting over time and the organisation is aiming to help set the pace in the next revolution in additive manufacturing. ACES professor, Marc Panhuis, said just as the capabilities of 3D printing have begun to infiltrate industry and the family home, researchers have started to develop 3D printed materials that morph into new structures post production. This is done under the influence of external stimuli, such as water or heat - hence giving it the name 4D printing. “So, as in 3D printing, a structure is built up layer by layer into the desired shape, but these new materials are able to transform themselves from one shape into another, much like a child’s Transformer toy,” Panhuis claimed. According to Panhuis, there is much more to this technology that what many think it can do. He mentioned that this science promises advancement in myriad fields, such as medicine, construction, automation and robotics. ACES researchers are increasing their focus into the medical field of soft robotics, by manufacturing a valve that actuates in response to its surrounding water’s temperature. The valve is a 3D printed structure, which has possessed actuators activated solely by water. 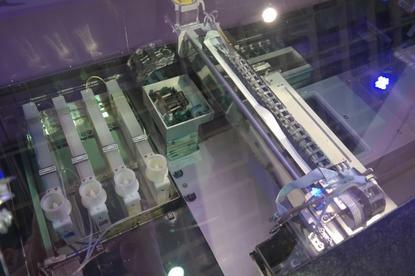 ACES claims the group is the first to combine printing this 4D device with four different cartridges simultaneously, while using tough gels with the incorporated actuating materials. “The cool thing about it is it’s a working functioning device that you just pick up from the printer. There’s no other assembly required. It’s an autonomous valve, there’s no input necessary other than water; it closes itself when it detects hot water,” Panhuis said.